Pumpkin Head and Grinning Skull twist-and-turn, Freaky Insects dance via string pulleys, Goblin in the middle sways back and forth with a light push and Hobgoblin on top "squeaks" when his head is pushed. Check out the secret peep hole to take in all the sights. 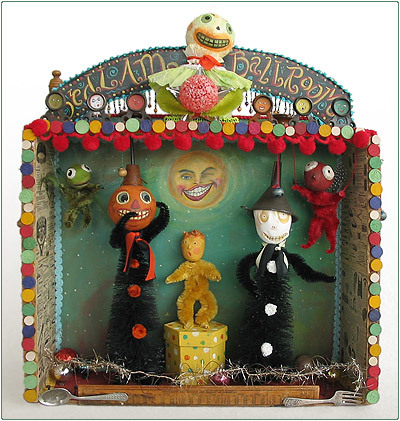 A plethora of found objects, beads, game pieces and tinsel add to all the craziness.